A $40 million rowing and aquatic sports center in Florida will feature the world’s longest breakwater, at nearly a mile long, and at 12 feet wide it can be used by a Fiat 500 camera car during races. The 5,070-foot floating concrete system, to be constructed at Nathan Benderson Park in Sarasota, Fla., will be built by Marinetek at the company’s new production facility. 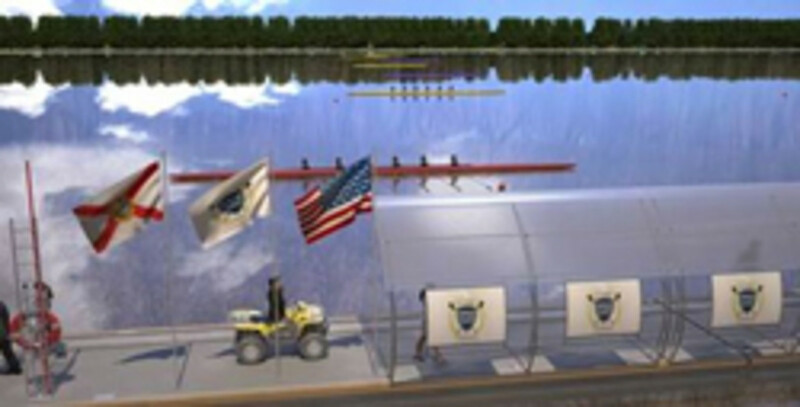 Benderson Development LLC awarded the design-build contract, and its project leader, Paul Blackketter, says the course will be the only one in the United States to receive an A rating from the International Federation of Rowing Associations, the international governing body that hosts the annual World Rowing Championships. The Marinetek floating wave attenuator will run the entire length of the 500-acre freshwater lake to create a protected racecourse. When it’s not in use for racing, three of its sections will open to give boaters access to the whole lake. The 50-foot-long attenuator floats are under construction at Marinetek’s new manufacturing facility in St. Petersburg, Fla., which will be formally opened on Tuesday by St. Petersburg Mayor Bill Foster. The Benderson floats are set to be completed by the autumn. The St. Petersburg facility is now the home base for all Marinetek North America projects.